a. 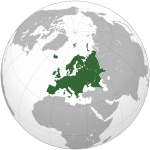 ^ Danish monarchy reached Iceland in 1380 with the reign of Olav IV in Norway. b. ^ Iceland, the Faeroes and Greenland were formally Norwegian possessions until 1814 despite 400 years of Danish monarchy beforehand. c. ^ "Statistics Iceland:Key figures". statice.is. 1 October 2002.
d. ^ "CIA – The World Factbook – Field Listing – Distribution of family income – Gini index". United States Government. Retrieved 14 September 2008. Íslándì[note 1] (Íslándíkì: Ísland; IPA: [ˈislant]) je is orile-ede erekusu Europe ni to budo si Okun Ariwa Atlantiki lori Ebe Arin-Atlantiki. O ni olugbe bi 320,000 ati apapo iye aala 103,000 km2 (39,769 sq mi). Oluilu re ati ilu totobijulo re ni Reykjavík, pelu ayika re to ni ida meji-inu meta olugbe orile-ede na. Iceland je agbese lileru ati loro-ile. ↑ The country's official name is Iceland. 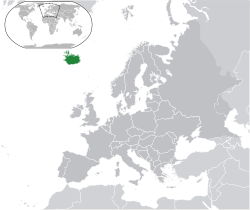 Although many sources—including the CIA World Factbook, Encyclopedia Britannica, and the United Nations—give "Republic of Iceland" (or "Lýðveldið Ísland" in Icelandic) as the official name, this conventional long name is actually not the official name of the country. The word "republic" is used only descriptively of the country's form of government and is not part of the country's actual name. This has been explained in a letter from the Office of the Prime Minister of Iceland to Ari Páll Kristinsson, Associate Professor at the Árni Magnússon Institute for Icelandic Studies. ↑ 1.0 1.1 1.2 1.3 "Iceland". International Monetary Fund. Retrieved 2010-04-21. ↑ "Iceland". The World Factbook. CIA. 20 January 2010. Retrieved 17 February 2010. ↑ "Iceland". Encyclopedia Britannica. Britannica.com. Retrieved 17 February 2010. ↑ "CIA – The World Fact book – Iceland". Government. United States Government. 20 July 2006. Retrieved 6 August 2006. ↑ "Statistics Iceland". Government. The National Statistical Institute of Iceland. 14 September 2008. Retrieved 14 September 2008. Jonsson, Asgeir (2008). Why Iceland? How One of the World's Smallest Countries Became the Meltdown's Biggest Casualty. McGraw-Hill Professional. ISBN 978-0071632843. Àtunṣe ojúewé yi gbẹ̀yìn wáyé ni ọjọ́ 1 Oṣù Kẹ̀wá 2017, ni ago 07:41.